The smart factory demands for production line equipment, monitoring, security checking, and data analysis initially started because of a promotion by the German government for something they called Industry 4.0 and the idea of Future Factories which originated from Japan. The realization of these concepts has become the driver for Industrial IoT. There are huge numbers of factory production lines waiting for automation upgrades but space limitations means they cannot be easily upgraded or changed. Many SME enterprises in Japan are looking for compact systems that are able to be installed inside their existing systems to upgrade their production lines and reduce their dependency on human resources at the same time. These factories are often built many years ago and would require a huge investment for new factory expansions. Budget control is paramount to smaller SME so they only need entry level systems together with AI module cards and other peripherals that precisely meet their requirements. For one package security checking customer, Advantech provided their EPC-S201 palm-sized embedded PC equipped with an Intel Celeron N3350 processor. EPC-S201 provides multiple I/O including up to 4 x RS-232/422/485 ports, 1 x GbE port, 1 x mPCIe, 1 x mSATA, 8 x isolated digital I/O, 2 x USB ports, and VGA. It can also easily be integrated with diverse expansion modules, additional memory/storage, digital and analog I/O, and wireless communication based on customer needs. USB ports can connect to AI module cards helping accelerate production security checks without taking too much of the CPU’s resources. 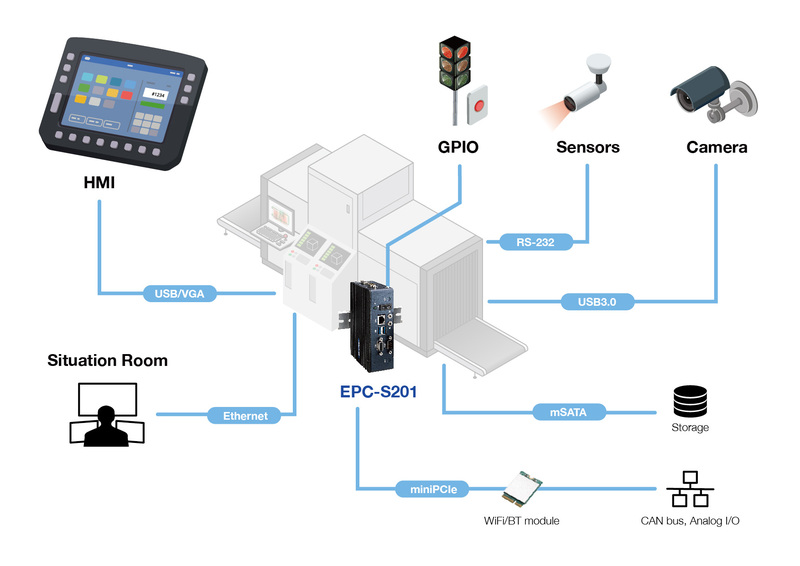 In addition, two ports of RS-232/422/485 are able to connect IR sensors or printers, and a WIFI module helps to collect and transfer data. Overall, this solution helped the customer to rebuild their production lines with only a small amount of investment.